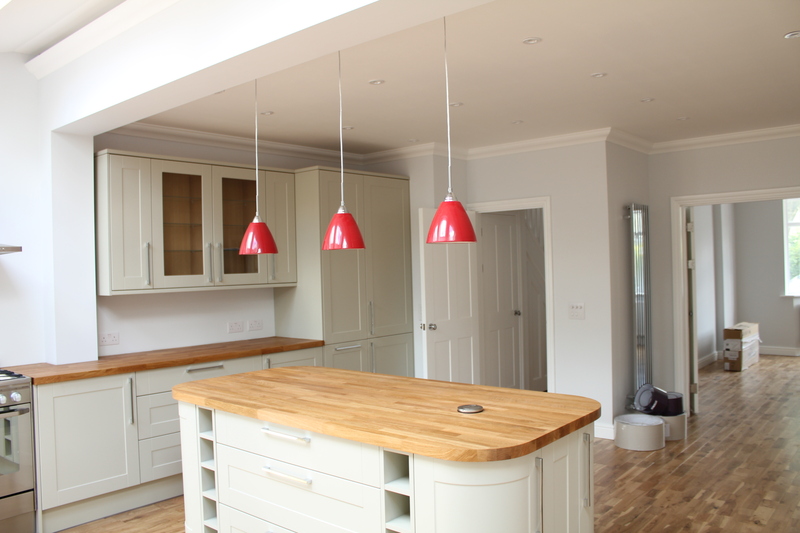 1st Phase Electrical Ltd are Lighting and electrical installation specialists based in North London covering Hertfordshire and Essex. 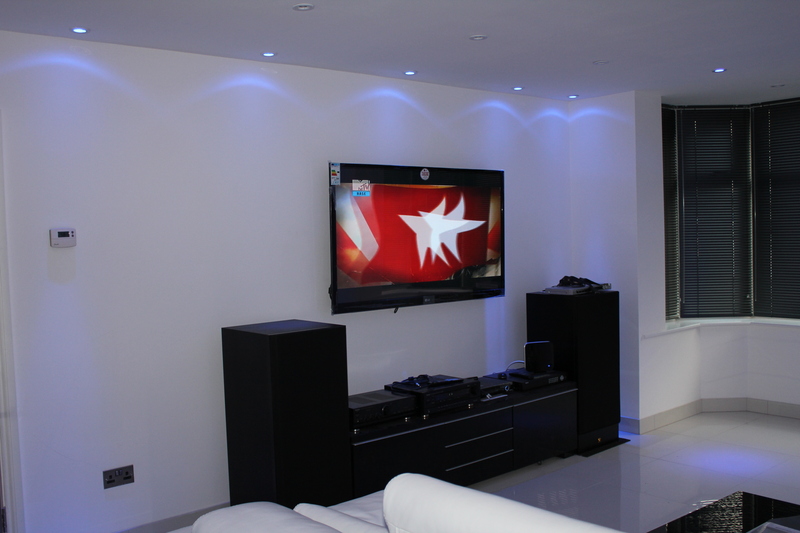 We work closely with you to create the perfect lighting and power install for today's modern lifestyle. 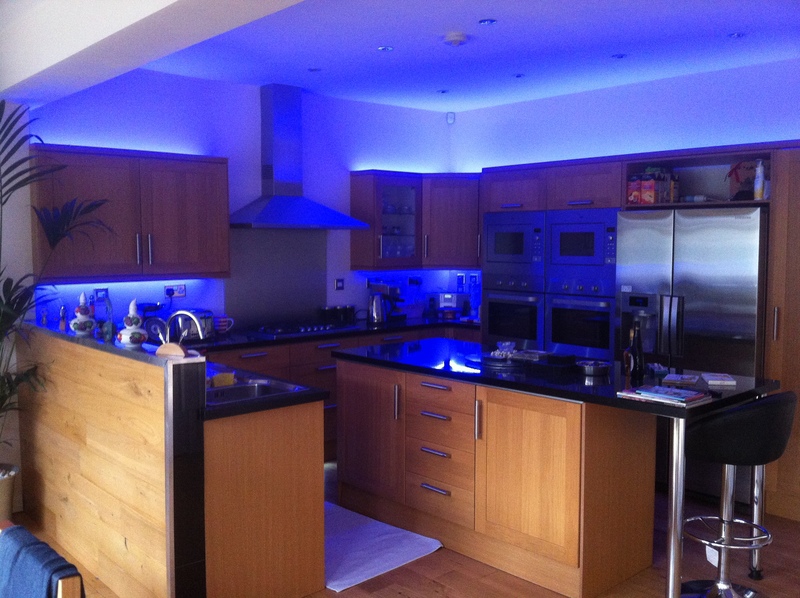 We specialse in dimmable lighting schemes for Kitchens, including power outlets, automation and USB charging outlets. We use energy saving LED Lamps to reduce electrical bills and reduce heat emission which is normally found in halogen lamps. Kitchens are the most lived in areas of the house. It's a place where all the family get together and having the correct lighting and electrical power at hand for laptops, ipads and iphones is important to avoid a trail of extentions all over the place. 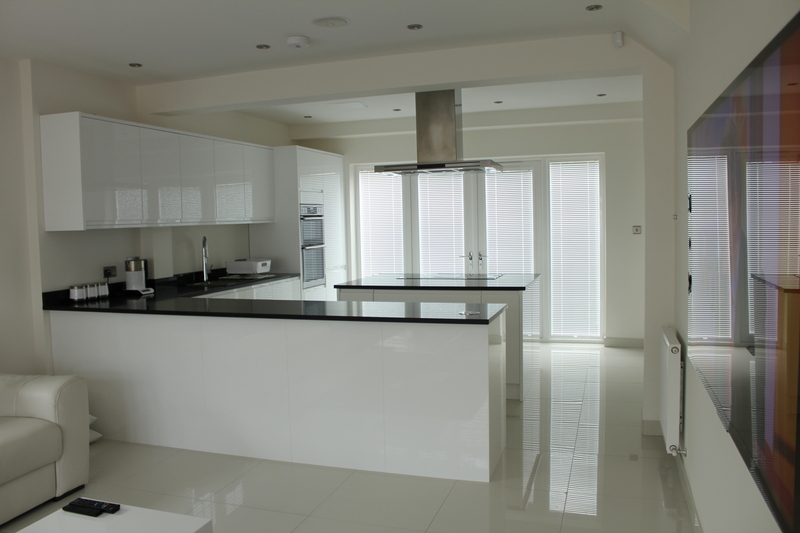 The under unit, over unit and plinth lighting will create a great ambience and define the kitchen worktops and floor. It creates a relaxing mood for after dinner drinks and entertaining. Lighting above dining tables in the way of dimmable pendants creates an intimate mood for those candle lit dinners. 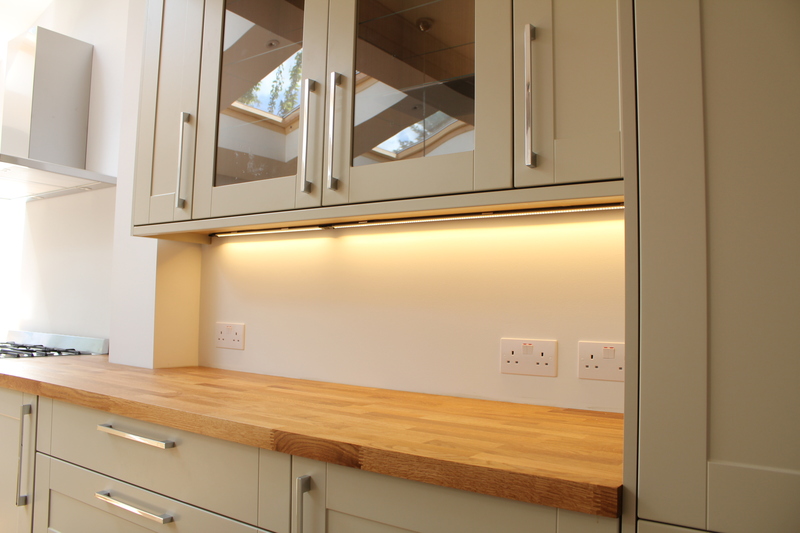 By using white spotlights and wall switches, we have kept the look of the kitchen white and minimal without too many outstanding accessories. 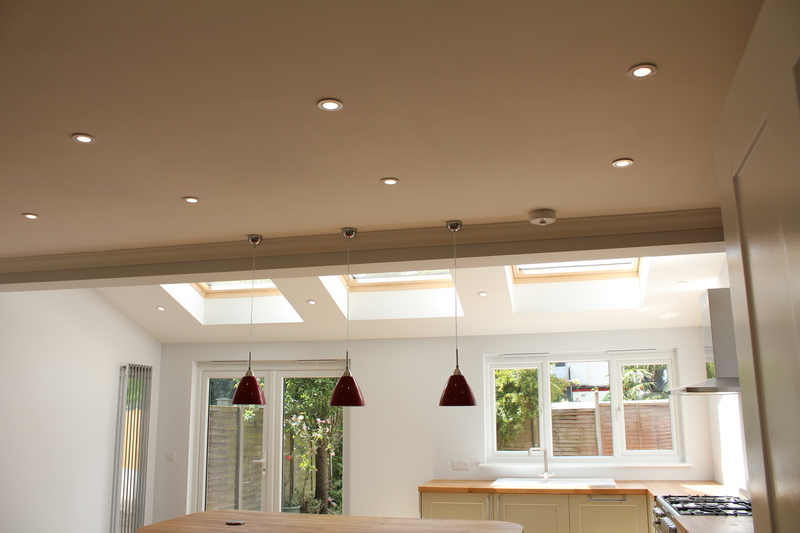 Our fire rated spotlights are installed using laser lines to ensure even spacing and a pleasing look. 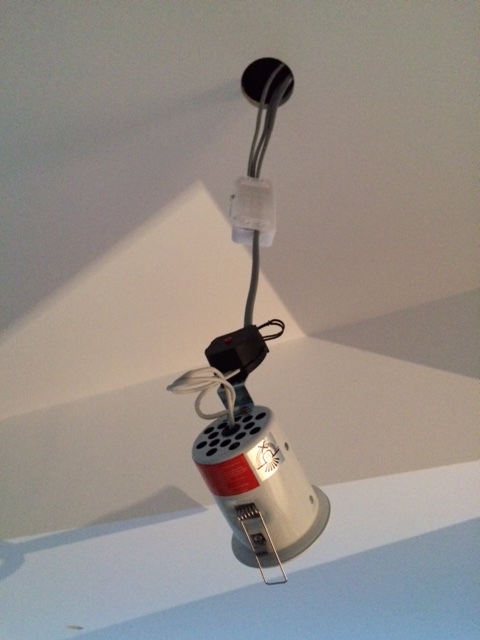 In areas such as hallways and rest rooms, we install presence sensors to activate the lights and in this case, the totally silent WC extractor fan. This saves enery on lights that are normally left on and hygenically, enables operations of lights without touching wall switches. 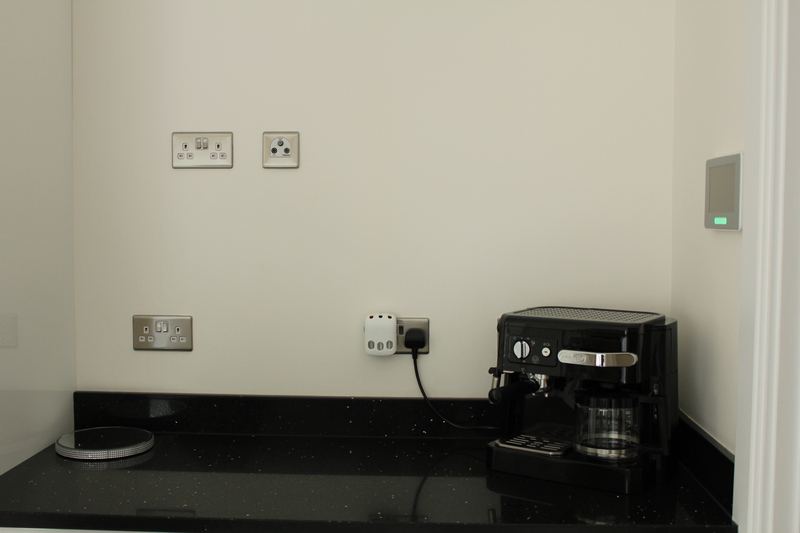 Installing worktop sockets with USB connectors (chargers) is a great way of avoiding cables plugged into extentions accross the floor that can cause accidents. Installing speakers into the ceilings and blending them in so that they do not stand out too much. The speakers are controlled by volume controllers on the wall. 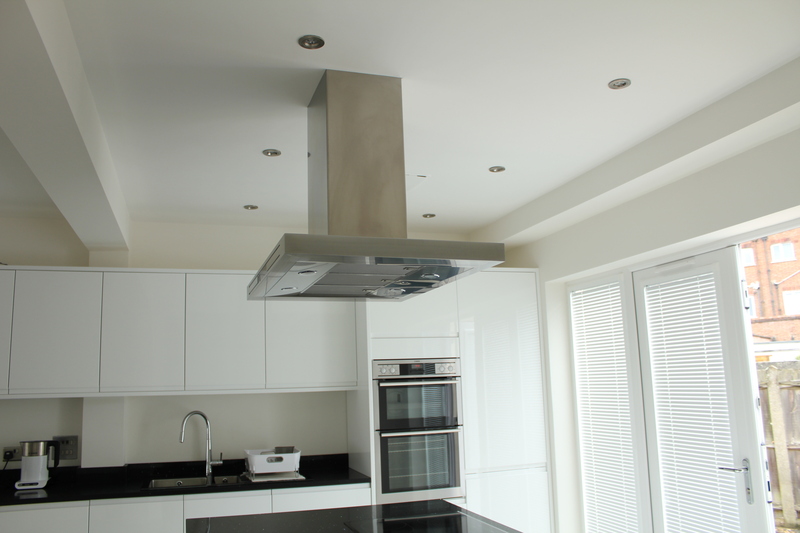 The Extractor Fan here was installed precisely above the worktop and all positioning & planning was pre-arranged so that at the time of install, the ducting was situated in the correct place. The isolator was located on a grid switch system nearby. This area has been prepared for TV with a power socket and TV aerial/Cat 5 Networking cable RJ45) and to the right is the monitor for the door entry system. 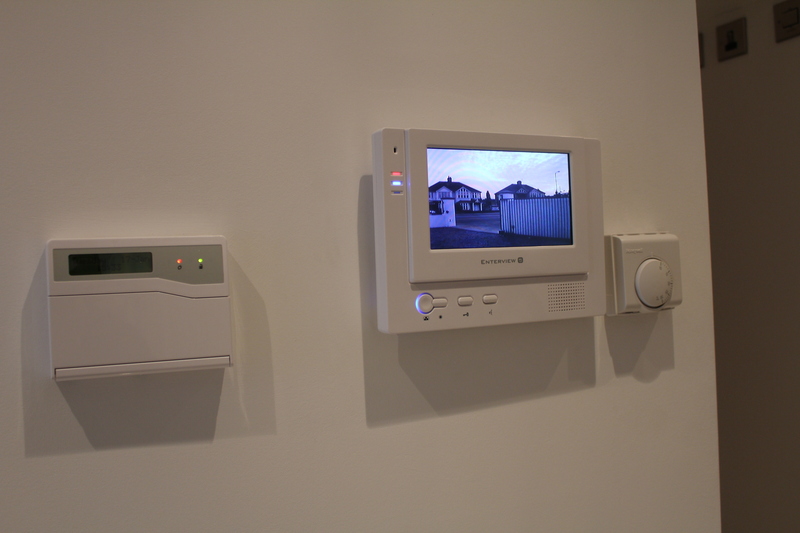 The door entry video system in this case has 2 monitors; 1 on each level of the house and a call from the front door can be answered from either monitor which also acts as an intercom internally. 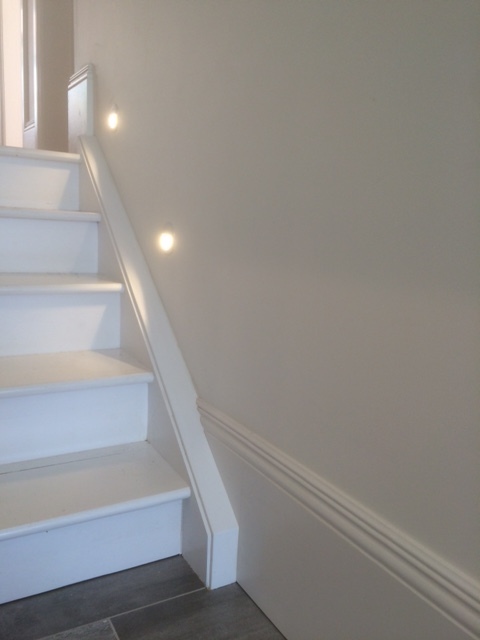 We Have installed LED Stair lights. These low level lights have a separate LED Driver. They only use 3 watts each making them very economical to use. 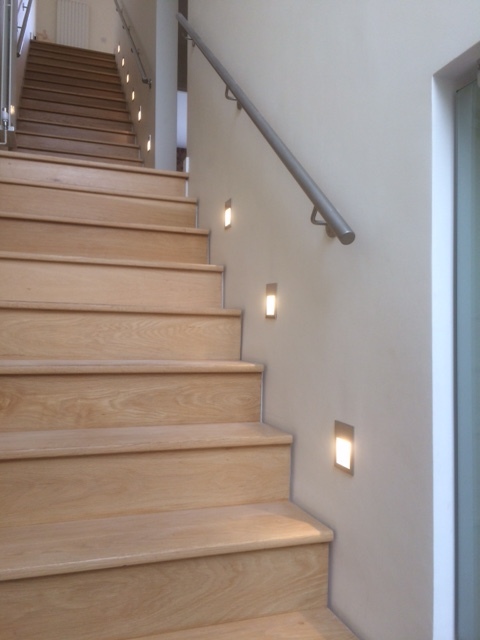 We have used the same LED stair lights at low level. 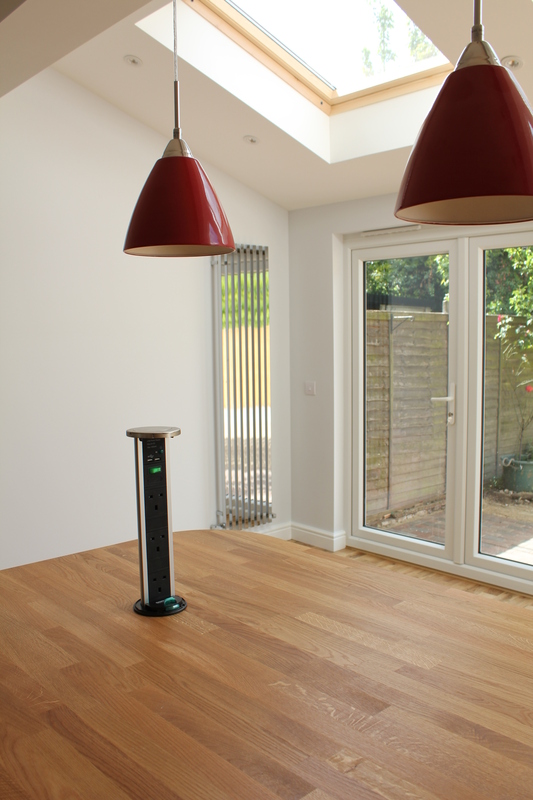 These give a great light at night and creates a very nice warm effect and brings out the richness of the wood floor. 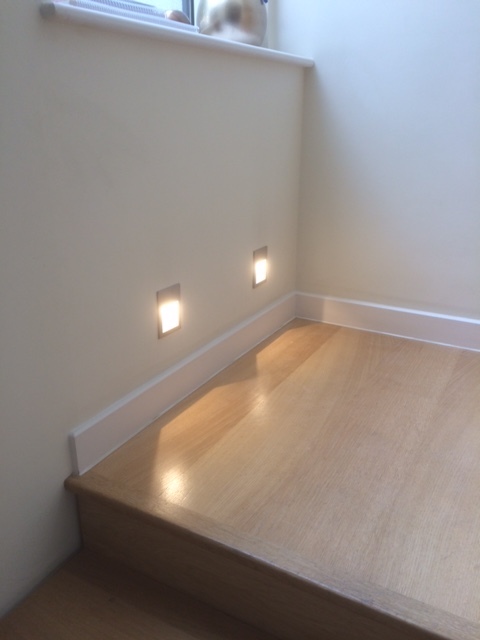 In this installation, we have used round LEDs that do not require an LED driver. They look beautiful at night and create very nice mood lighting. 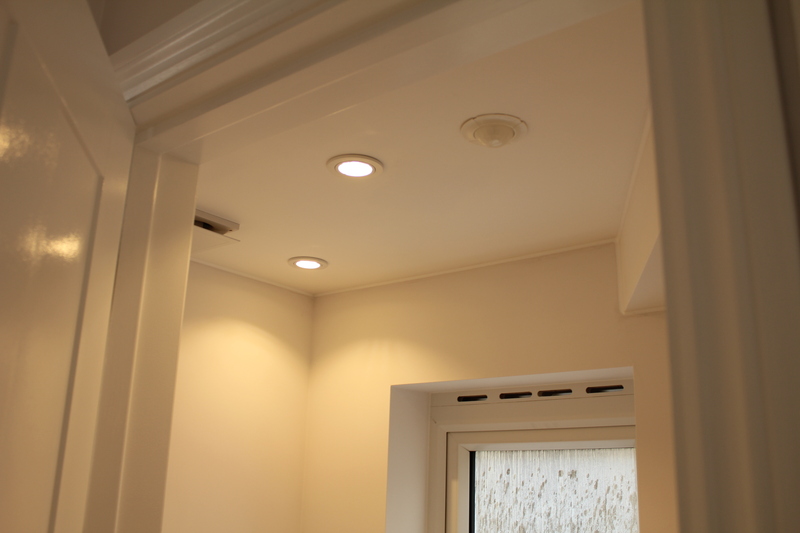 On the right here is a typical install of a down light (spot light). 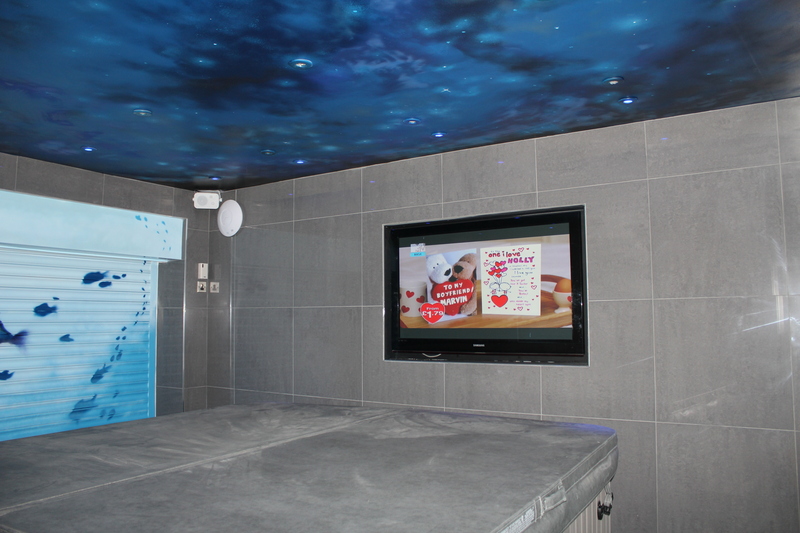 We use Aurora or Knightsbridge brands which are fire rated from 30 mins to 90 minutes. In the majority of cases, we install 230V GU10 fittings. You can then choose a lamp colour you prefer for example a GU10 LED 3000k warm white or 2700k very warm white or a 6000k cool white. LED lamps do not get extermly hot as the old halogen lamps, making them safer in the installation. Also, approx 10 new LED lamps will consume the energy of just one old 50w halogen lamp as the new LED GU10's are rated at about 5 watts each. We can also supply dimmable GU10 lamps. However, the dimmer controlling the lights must be changed to a trailing edge LED dimmer module. 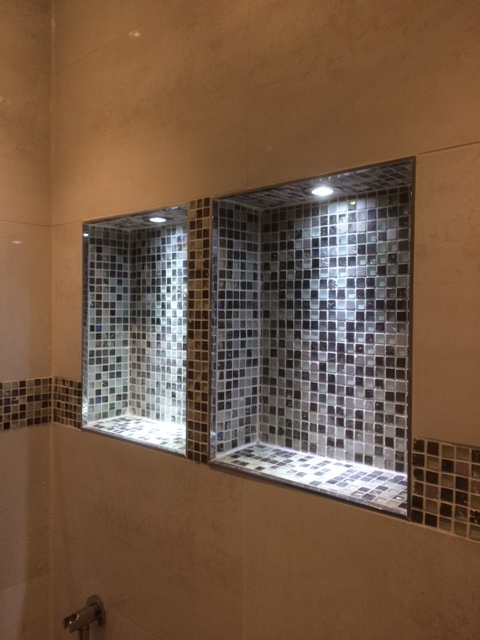 We can do this and if the dimmer switch you have is for example a metal plate designed unit, we can just change the dimmer module so that you can keep the original switch plate if you require. 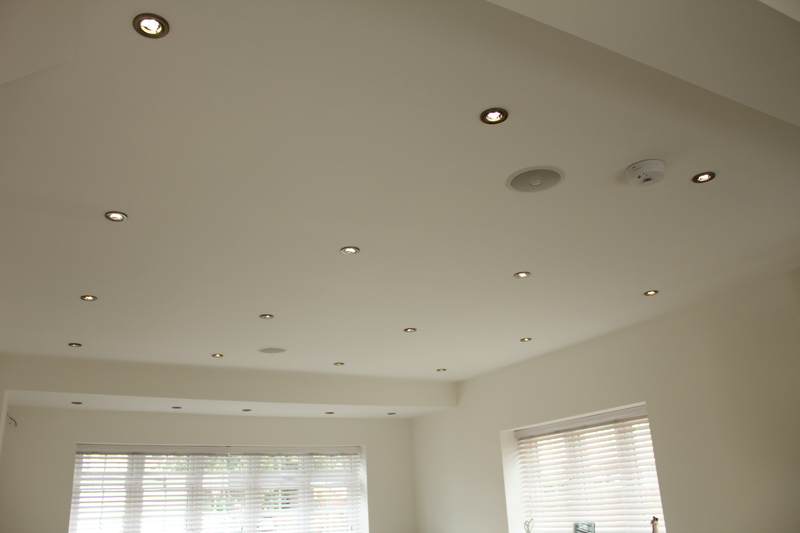 Above, we have installed Extra Low Voltage, IP68 Marine grade LED spot lights. These lights are only rated at 3 Watts each and give a great light. At night, they make great mood lighting when the main room lights are turned off. 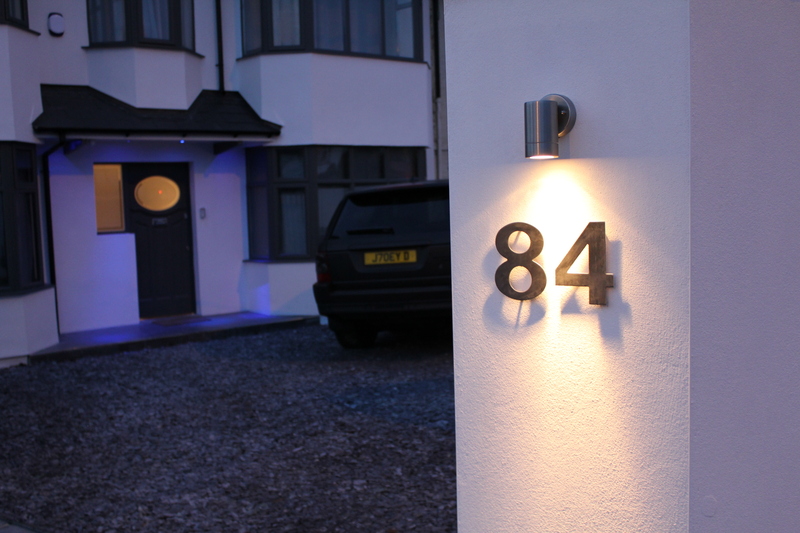 For external lighting we use a different range of products and lamp colours but always use LED for enery saving and longevity of the product. 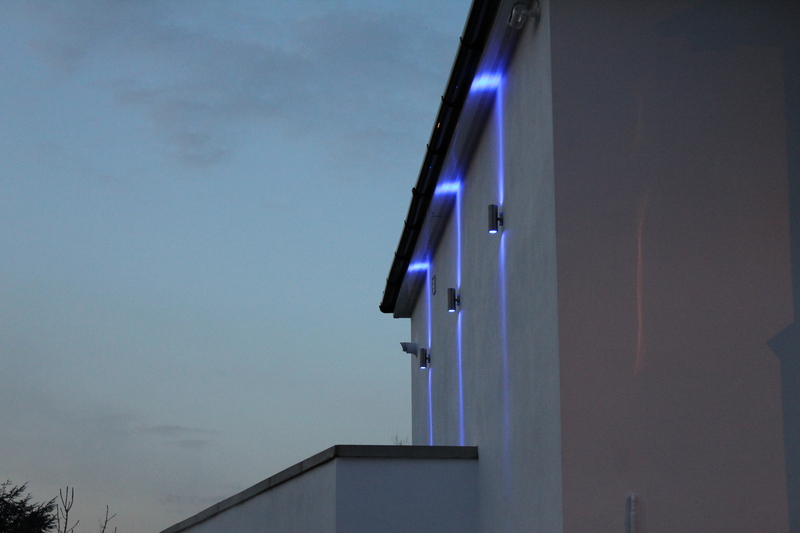 On the picture to the left, we have used blue LEDs that stand out on a bright white external wall and in the centre photo we have installed downlights (spotlights) with the same blue LEDs. 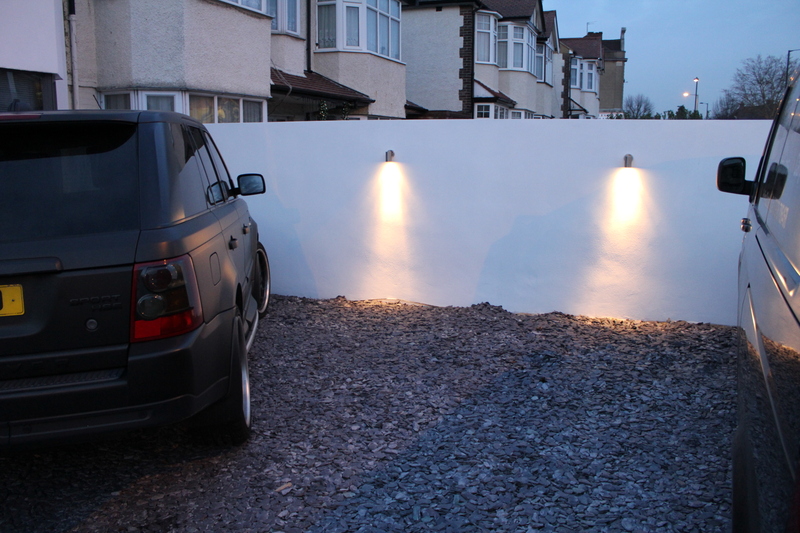 The car parking and external wall have been lit with warm white lights to assist the customer with parking. 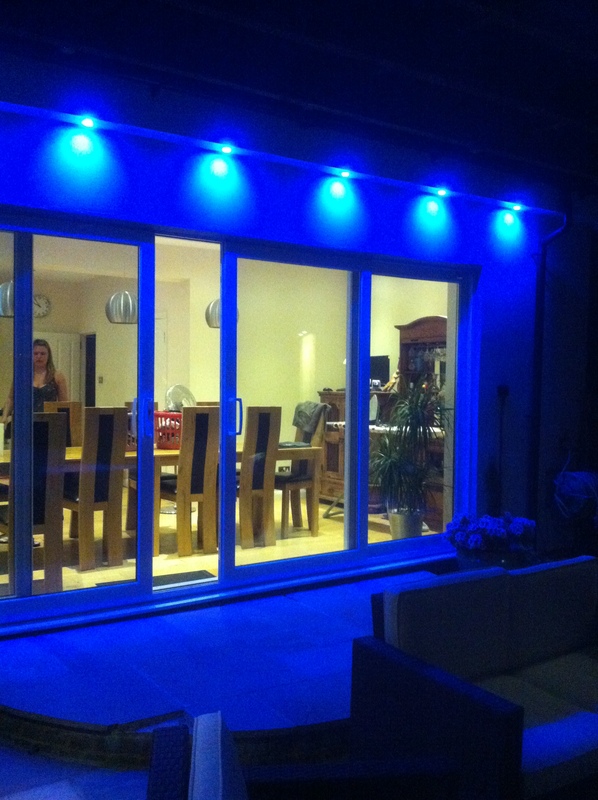 LED Lighting is energy saving and is exciting! In a normal scenario where you have 10 x 50watt GU10 normal halogens using 500 watts, 10 LED lamps will only use up 50 watts - thats a massive 90% energy saving rating and the LED's will pay for themselves in a very short period of time. We promote the use of sensors and photocells for energy saving. We always promote prescence sensors in hallways and toilets and small utility areas where the lights can be left on unnecessarily for long periods of time. 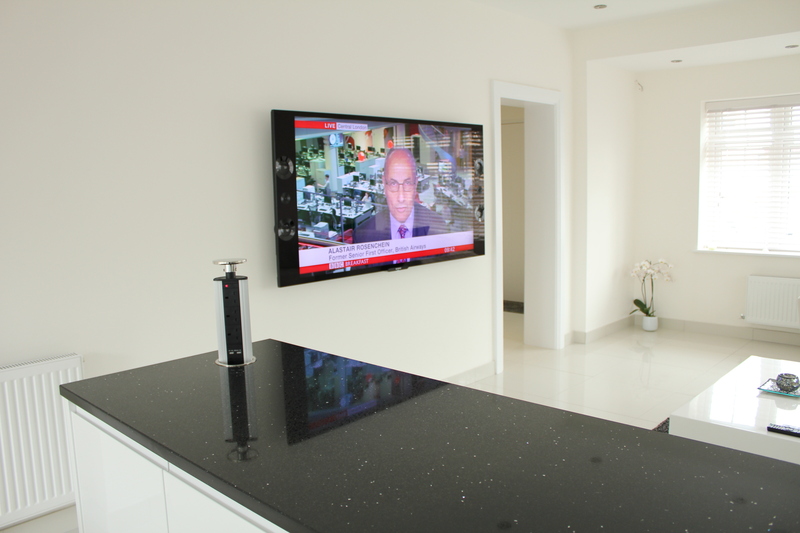 We can install worktop socket which retract from the worktop. This is a useful and practical solution as it has a USB charger point built in so you can sit at the worktop and use your laptop of tablet without having to keep charging it!